(Programme for the Endorsement of Forest Certification™) Chain of Custody certification. The certification supports the Company’s commitment to sustainable fiber sourcing principles. “The addition of PEFC certification is important both domestically and for its international reach. The standard enables our customers to have confidence the products they use from Twin Rivers are produced using practices that are consistent with their global procurement and sustainability initiatives,” said Dave Deger, Vice President, Strategy & Marketing. 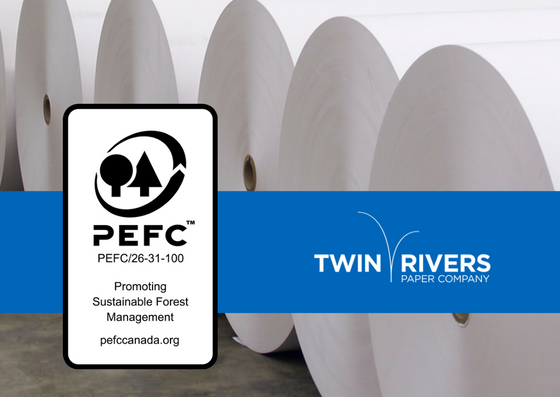 This rigorous international third-party standard ensures the wood and fiber used to make the Company’s lightweight specialty paper and dimensional lumber products originate from sustainable, well-managed forests. In addition to PEFC, Twin Rivers holds Sustainable Forestry Initiative® (SFI®) and the Forest Stewardship Council® (FSC®) chain of custody certifications enabling the company to offer its industry-leading packaging, publishing and label papers under all of the three certification programs. Chain of custody certification requires robust systems and accurate traceability procedures to track the path of fiber-based raw materials from the forest through finished product. The PEFC standard requires that wood and fiber source use globally recognized principles of forest management intended to prevent deforestation and safeguard forests while respecting the highest ecological, social and ethical standards. As the largest forest certification system in the world, the Programme for the Endorsement of Forest Certification is comprised of 38 endorsed national certification systems and more than 670 million acres of certified forests. In North America, the more well-known certification systems endorsed by PEFC include Sustainable Forestry Initiative® (SFI®), American Tree Farm System (ATFS) and Canadian Sustainable Forest Management Standard (CAN/CSA-Z809-08).